Speck, Salami Milano and Coppa, Nocellara olives, Italian slow roasted vine tomatoes and Bella Lodi ® medium fat hard cheese. 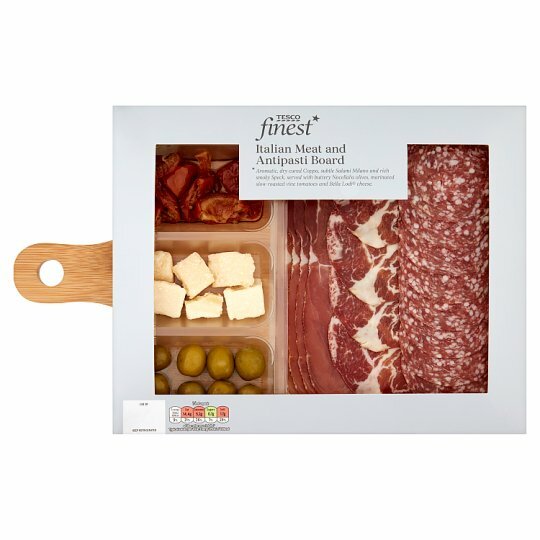 A pairing of meat and antipasti platters containing Coppa, Salami Milano and Speck, and Nocellara olives, marinated slow roasted vine tomatoes and Bella Lodi ® cheese. Packaged in a protective atmosphere.Nocellara Olives - Caution: Olives contain olive stones. Sliced Speck, Salami Milano and Coppa. Speck contains: Pork, Salt, Dextrose, Black Pepper, Antioxidant (Sodium Ascorbate), Preservative (Sodium Nitrite), Fructose, Dried Garlic, Juniper Berries, Pimento, Fennel, Nutmeg, Clove, Mace, Coriander, Cinnamon, Laurel. Prepared with 153g of pork per 100g of Speck. Salami Milano contains: Pork, Salt, Dextrose, White Pepper, Antioxidant (Sodium Ascorbate), Preservatives (Sodium Nitrite, Potassium Nitrate), Dried Garlic, Starter Culture. Prepared with 146g of pork per 100g of Salami Milano. Coppa contains: Pork, Salt, Dextrose, Black Pepper, Nutmeg, White Pepper, Antioxidant (Sodium Ascorbate), Coriander, Preservatives (Potassium Nitrite, Sodium Nitrite). Prepared with 145g of pork per 100g of Coppa. Bella Lodi ® medium fat hard cheese.